At Envision, our clients are seeing significant dividends from digitising their construction timesheets. The more we talk with a range of project and business stakeholders across the construction industry, the more we’re seeing this as a huge area of improvement potential. 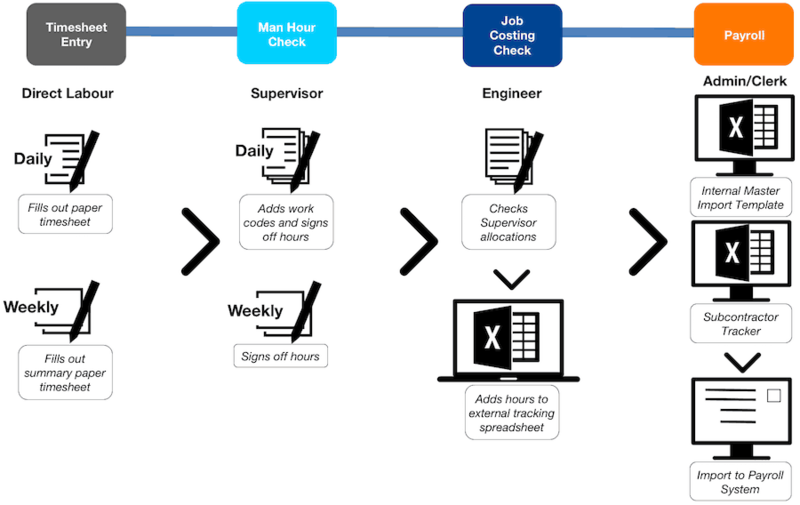 Some of the people who influence decisions around technology adoption may not have frontline experience, so we’ve put together this summary of the fundamentals of construction timesheets to help build a baseline of understanding. Time clocks and attendance records perform functions like recording when specific people arrive at and leave a site. Depending on the process used, they might record who is on site at all times (ie entry/exit rather than solely clock on/off records). Start and end times generated also may not be the same as a person’s start and end time for payroll (eg you might arrive 15 minutes before your scheduled start from which you will be paid). Timesheets, in contrast, record the quantum of work performed against a specific job/costed activity. They are normally used to drive payroll, as well as job costing and performance reports. Both have distinct roles and, when they are both in use, cross-referencing them is a powerful way to identify errors such as missing timesheets and incorrectly recorded timesheets, and verify actions such as payroll and subcontract payments. The approach to capturing time from a contractor’s perspective depends on the contract type and delivery model. Timesheets are generally required for staff, direct workforces, labour hire, and hire plant and labour on day dockets. As an example, if a project’s delivery model is largely subcontract lump sum and schedule of rates, the need for timesheets will likely be basic. However, this may change if a project presents considerable risk exposure to the contractor or client if schedule completion milestones are missed, like on large oil and gas and mining projects where the cost of missed production is high. It’s critical to match timesheet processes, and the level of detail captured, to each project’s contract type and delivery model. Individual workers – they need a record for payment and a fast, simple process. Subcontractors – they need a record of their workers’ time to pay them and submit end-of-month progress claims, and need easy access and reliable records to ensure payment. Supervisors – they need to check and approve hours worked, ensure costs are allocated to the right activities, get feedback on their team’s performance, maximise their field time to keep their project on track, ensure their people get paid and avoid IR issues…and the timesheet process needs to be fast and simple. 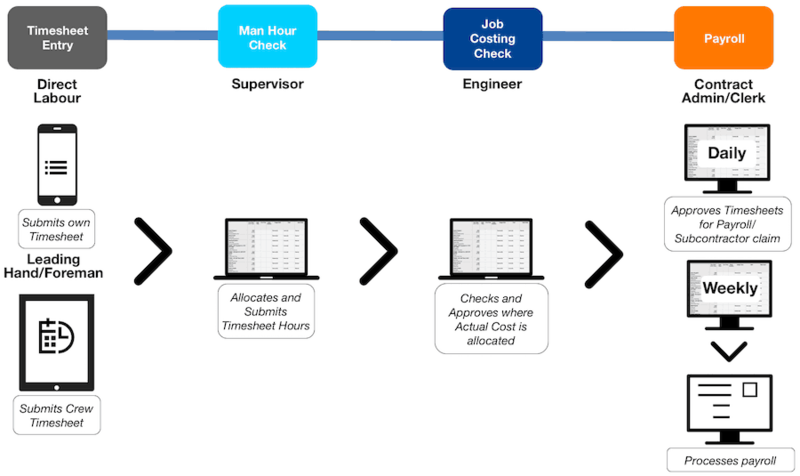 Engineers – they approve the allocation of costs to the right activities, monitor performance across their scope and forecast job costs based on past performance and forward projections. Project managers – they monitor scope performance, ask questions on exceptions and guide corrective actions to keep their project on track. Payroll – they track leave, and pay staff and workforce their entitlements and allowances. Contracts administrators – they verify subcontractor progress claims, approve appropriate payments and determine accrued costs that haven’t yet hit the finance system. CFO – they need accountability and certainty around who is getting paid what, and they need an appropriate audit trail to drive verification and responsibility. HSE – they track safety exposure hours worked and safety performance statistics. Commercial – they require quantified and verified records to substantiate claims for variations and extensions of time. Project controls – they require quantified records for performance reporting. Estimators – they require quantified records of time required to perform various activities for comparison against estimating norms to improve competitive estimating on future jobs. With these fundamentals in mind, manual processes present major risks to projects and leak a significant amount of value (either lost time to perform value-adding tasks or avoidable costs etc). Here is the core difference between typical manual processes and digital processes. In reality, while the digital process sounds simple, the devil is in the detail. Paper seems very forgiving, with minimal validation rules and a human to interpret records. It is also infinitely flexible as it can be routed through different hands to record and extract data. And it seems easy and fast in the first instance. Successful adoption of a digital process requires solid upfront thinking and a simple, intuitive solution that is fast for all stakeholders to use. Then it can remove the need for duplicate timesheet records held in disconnected systems by those diverse stakeholders. We’ll share more on considerations for selecting digital construction timesheet solutions soon. If you’ve moved from manual, paper-based timesheets to digital ones, we’d love to hear about your experiences. If you’re intrigued, we suggest you map your own process as you might be surprised at the admin waste and data delay waste for all of those stakeholders involved. And please get in touch if you’d like to know more about our offer in digital construction timesheets.